This class is suitable for all levels of dancer. In this class we explore the basics for belly dance: posture, hip work, basic torso isolations, arms, basic dance steps and introduction to finger cymbals. Connect the dots and expand. This class bridges the gap between beginning basics and intermediate level classes. Dancers who are ready to take their dance to the next level, but not feeling quite ready for intermediate class, this is the class for you. In Level 2 Basics, we will work on honing basic dance technique while introducing some more complex steps and shimmies. Dancers will also be introduced to simple dance improv concepts such as fades and turning the wheel. Moving beyond the basics, students explore the beauty of group improvisation, working in pairs, trios, quartets, and larger ensembles. While exploring more intricate dance steps, students also learn how to move these steps around the floor, how to cue changes in formation including fades, spirals and more. Students will continue to improve their finger cymbal playing and develop their musicality with regard to the dance. We also will regularly work with belly dance props in this class such as balancing props(baskets, swords, trays), veils, and more. Students encouraged to bring a dance notebook to class. Developing the Dancer:stagecraft, choreography drills, performance scenarios, skills, and drills. In this class, students refine their dance skills by drilling choreographies, observing, practicing different performance situations and learning how to adjust appropriately to fit the situation. Learn how to craft your presentation for nightclub verses stage presentation. This class is open to multiple skill levels. Ultra Fun workout class!! Energetic and lively, think Zumba but with belly dance and a few other surprises! This class is open to all skill levels. The class typically begins on the floor for stretching and conditioning and works itself into fun frenzy designed to build your dance stamina. In Level 1 we learned the foundational steps for ATS® - the basic vocabulary, cues and formations. From this beginning, we can now learn steps and combos to become more fluent with tribal improvisation. The class is $60 for 6 weeks or $15 for drop-in. If you have a 5-class or 10-class punch card, you can use it for this class. If you have a monthly unlimited card, there is a discount of $50 for the whole session. Classes held at Mecca Studio, 3270 Nicholasville Rd. (inside Artistry in Motion Studio) Lexington, Ky. Wear something comfortable that will allow me to see your torso so that I can correct your posture. I also want to be able to see your feet, so yoga pants or pantaloons will work well. If you want to wear a skirt, I’ll show you how to tuck it up. A hip scarf is always fun. I also recommend wearing your hair up off your neck since we’ll spend a lot of time checking the neck and shoulders for cues and placement. Please bring your zils (finger cymbals) to every class. I started belly dancing in 1975 with Lexington teacher and dancer, Judy Said. 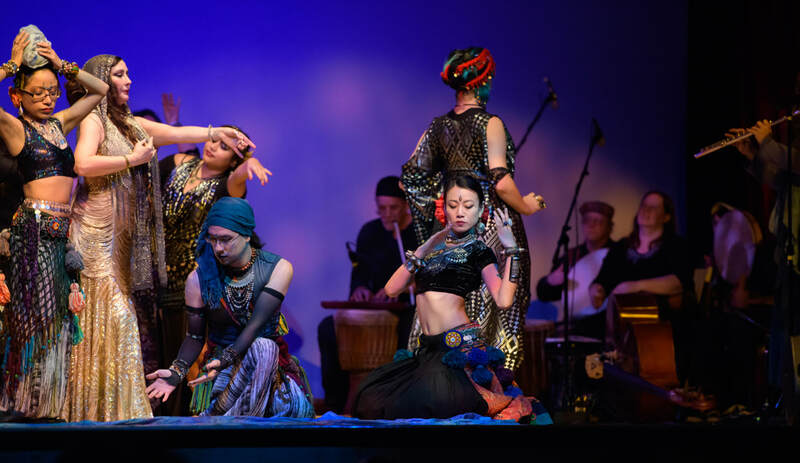 Since then, I’ve supplemented belly dancing with many other styles, including West African dances, Caribbean dances, contemporary, and tap dancing. In 1993, I left belly dancing to pursue my Ph.D. in Dance Anthropology, but returned in 2002 to discover that there was this new tribal style of belly dancing that I had missed! In 2006, I took two Tribal Pura workshops with Carolena Nericcio-Bohlman and Megha Gavin and was hooked! I bought all the videos sold at that time by Fat Chance Belly Dance and learned what I could; and I took a couple of workshops with Blue Lotus Tribal from Chicago. There is no substitute for a live teacher and other dancers to practice with, so I searched for an ATS® teacher and finally found Heidi Capps-Hayden in 2013, driving 4 hours in one day to take classes. After repeating Level 2 a couple of times, I started dancing with Heidi and Sevanti Tribal Belly Dance which was so awesome that I want to continue improvising with dancers in Lexington! Level 2 Part I will run for 6 Wednesdays thru Dec 5th. The class is $60 for the 6 weeks or $15 for drop-in. If you have a 5-class ($60) or 10-class ($95) punch card, you can use it for this class. If you have a monthly unlimited card, there is a discount of $50 for the whole session. We're gonna put a little Hindi spice into our belly dance! Drawing from dance influences of India, this class will explore mudras (hand gestures), the art of expression and acting (abinaya), a little bollywood, bhangra, and folkloric dances of Rajasthan and layer them with some common belly dance steps. Fun, expressive and energetic. Open to all skill levels. -In this class students will explore the basics of Hawaiian Hula dance. We will dance both Kahiko (Ancient) and Auana (Modern) styles of Hula as well as explore a touch of Polynesian Tahitian Ote' style. The class will focus on the hands, foot positions, gestures, hip movements as well as the history behind each of the dances. This session will include the percussive aspect of Flamenco rhythms (compas), technique, and the projection of its passion through intention. Open to all skill levels from beginners up. (class cards expire 3 months from purchase) . A Series of Belly Dance Classes with Mecca Dance Studio on the Northside of town! 6:30pm -Been wanting to dip your hips into Belly Dance? The New year is a super time to start. 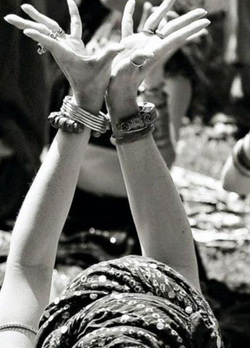 Jamming with the Basics (all skill levels welcome) We will work through basic steps, posture and arms for belly dance. 7:30pm-Level 2 Basics- We will start with an extended group flow (no talk, just dance) then progress into thrills, drills and zils. Jump into your New Year's resolution and get your dance and sweat on! Belly Aerobics- Northside Version! We will dance through a variety styles of cultural dance, building sweat and stamina while having a blast in a safe fun environment. 7:30pm- Specialty Duet Dance Choreography- "Hawabnawita"
This is a gorgeous and richly lush choreography built especially for duets!! Through this dance the dancers explore innovative transitions and floor patterns between each other. The dance is also full of gorgeous fusion combinations and turns. session fee: $60 , If you sign up with your dance partner, receive $10 discount!! NOTE: Thursday Jan 24th -Class will be held at Southside Studio- 3270 Nicholasville Rd.